How history has been used, and misused, during campaign 2016. A medievalist on the uses and misuses of history in the 2016 campaign. 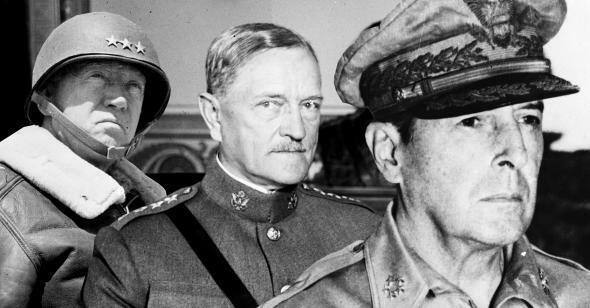 George Patton, John J. Pershing, and Douglas MacArthur. Photo illustration by Slate. Photos by Library of Congress. The Republican nominee for president of the United States, Donald J. Trump, is not known for a robust awareness of history. His impoverished historical vision seems limited to cherry-picked apocryphal examples of supposed heroes who would, Trump insists, be appalled at the current state of our nation. He channels the dangerous nuclear politics of Douglas MacArthur, whom President Truman famously relieved of his command for insubordination. He praises George S. Patton––who physically abused PTSD–afflicted soldiers, calling them “cowards [who] bring discredit on the army and disgrace to their comrades”––as “one of the roughest guys.” Trump has retold the feverishly Islamophobic (and possibly untrue) story of John J. Pershing dipping bullets in pigs’ blood before shooting Philippine Muslims during the Philippine–American war of 1899-1902. It would be tempting to dismiss Trump’s statements about history as ignorant ramblings, if his rhetoric weren’t so dangerous and didn’t comport so perfectly with the interests of America’s enemies. He complains that “we’re living in medieval times” when discussing the brutality of ISIS, while enjoying the widespread support of white nationalists who often look fondly upon medieval history as an age that forged white supremacy and who sometimes call for a modern “crusade.” Of course, such a clash of civilizations is precisely what ISIS is eager to provoke. The group has concocted a world of historical fantasy in which there are only jihadists and “crusaders,” a fantasy Trump buys into both in his speech and in policy proposals, like “extreme vetting,” that pit us versus them. The Middle Ages serve as convenient dumping ground for modern cultural problems, anxieties, and, more disturbingly, for racist ideologies. For ISIS, a “return” to a fictionalized medieval period suits its West-versus-the-rest narrative. But as I’ve noted in Slate previously, the ISIS vision of medieval times is highly fictionalized, fueled by a nostalgia for a time that never existed: As medievalists like Matthew Gabriele are clarifying, Eastern Arab and Western European peoples for centuries traded, cooperated, and otherwise interacted with one another constantly along a spectrum from empathy to toleration to, yes, armed conflict. The image of an eternal death-struggle between East and West is the direct result of ignoring this spectrum and focusing solely on conflict. Both ISIS and Trump benefit from ignoring or abusing history. They use murky historical interpretations to feed their ideologies, choosing only the moments that benefit them to form a universal narrative. But as much as this campaign has been about the destructive misuse of history, it has also reminded us of the power of honest historical study as a corrective to marginalizing and violent ideologies. 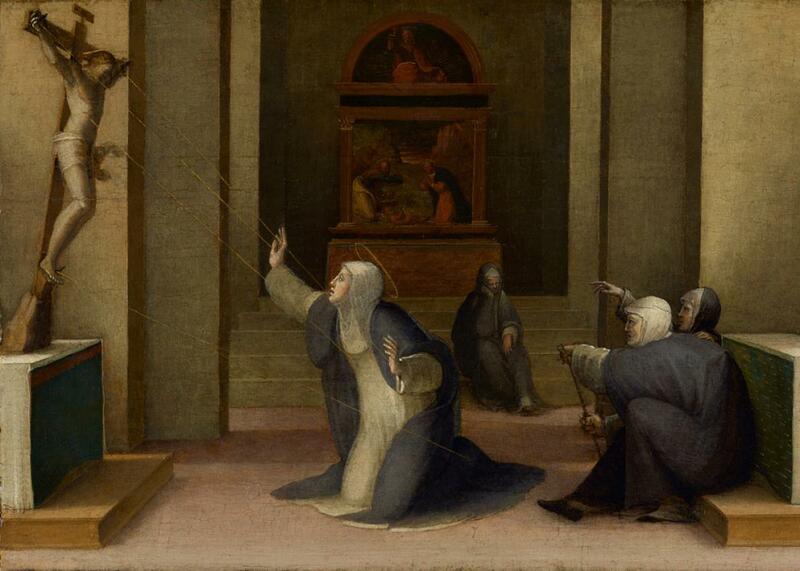 Saint Catherine of Siena Receiving the Stigmata. What else can an honest and empathetic study of medieval Europe tell us? In a widely shared and moving piece, the Washington Post’s Eli Saslow recently profiled Derek Black, the son of and would-be “heir” to Don Black, founder of the right-wing white-nationalist website Stormfront. From an early age, Derek Black embraced his father’s views enthusiastically. But during his time as an undergraduate student at the New College of Florida, Black experienced profound disillusion with the ideologies that shaped his childhood and experienced a conversion to decent, empathetic personhood. Black had looked to medieval European history––specifically “medieval Christianity”––to confirm his views on white supremacy’s foundations. He found instead that medieval Europe was, relatively speaking, “a technologically backward place that lagged behind Islamic culture.” What Black likely found in his studies were examples of the diversity of “medieval Christianity”: Perhaps he encountered a “medieval Christianity” that could sanction the decapitation of Arab defenders of Antioch in 1098. Perhaps he confronted a “medieval Christianity” that had centuries before helped Charlemagne justify the murder of some 4,500 Saxons in October 782. Perhaps he was astonished that the same splintered traditions could inspire, by contrast, the sixth- and seventh-century missionary and monastic reformer Columbanus to pen an achingly beautiful line of medieval Latin literature: “Understand creation, if you wish to know the creator.” Perhaps he attended a seminar on the theology and “holy fasts” of Catherine of Siena. These are just some examples of the diverse historical ambiguity that inquisitive students of history will discover. Black, Saslow wrote, “studied the 8th century to the 12th century, trying to trace back the modern concepts of race and whiteness, but he couldn’t find them anywhere.” Prior to this realization, Black used medieval Europe as a blank space on which to project his crackpot theories of natural white supremacy and the roots of white nationalism. What his experience shows us is that we can find whatever we want in the Middle Ages—or in any historical period––until we really get down to the business of trying to understand it. Black could have ignored what he had found in his studies. He could have continued making an all-too-common modern mistake: abusing the past to gratify a poisonous ideology in the present. He could have kept recycling his loathsome rhetoric in the service of supporting his warped interpretation of history. Instead, he found nuance, complexity, and, ultimately, freedom from bigotry––all in short supply in an election season dominated by Donald Trump’s dangerous and blunt-force uses of history.